Elk, regal racks sprouting skyward and heads held high, once were a common sight in Minnesota. With the exception of the coniferous forest of the northeast where Woodland caribou roamed, elk lived in Minnesota's hardwood forests and on its prairies. 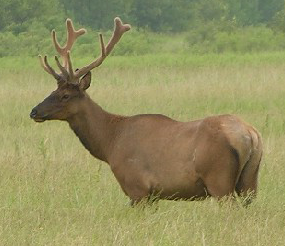 Elk received complete protection from hunting in Minnesota in 1893. But settlement and hunting – both market and subsistence – pushed Minnesota's population toward statewide extinction by the early 1900s. In 1913, the Legislature appropriated $5,000 to revive Minnesota's elk population. Animals from the western United States and part of a captive herd from Ramsey County were shipped to Itasca State Park and placed in an enclosure. Efforts to sustain native elk were not successful, and Minnesota's last native animal was seen in the Northwest Angle in 1932. Relocating 27 elk in 1935 from the captive herd at Itasca State Park to northwest Beltrami County near Grygla eventually produced a breeding population. It wasn't until the early 1980s that elk native to Manitoba crossed the Canadian border to calve and spend summers in Kittson and Roseau counties. Support for Minnesota's elk population appears to be increasing. Yet elk are large animals that often cause crop and fence damage. DNR strives to find a balance between landowner/farmer tolerance and the public's desire for more animals.